The TWA 800 saga and how it relates to the other Boeing 747 crashes, Air India 182 and Pan Am 103 - all three of which appear to have just "happened in clear air!" The following analysis will offer the reader an opportunity to evaluate the Boeing 747 crashes in a new light. It explains the unexplainable. This information will trigger a very serious soul-searching on the part of the entire aircraft industry and the government agencies who we once believed acted in the interests of the traveling public. This is a photograph of the doomed Boeing 747-100, flight TWA 800, as it takes off from JFK airport in New York. You can see that the front nose wheel is still down as is the main landing gear. This is normal and the pilot will raise the gear once the plane has sufficient height that, should an emergency occur, the pilot will have time to lower the landing gear for an emergency landing. It should be noted here that the first problem encountered by TWA 800 was that the nose wheel doors separated from the plane. During the recovery of the wreckage, the nose wheel doors were found to be located closest to the plane's departure point, and some distance from Section 41 - the nose of the plane. The nose wheel compartment is not pressurized and so the fact that it broke off was unlikely to have been the cause of the main cabin area failure but, just maybe, at 550 MPH it could have caused an additional stress on the already stress-fatigued area between Section 41 and Section 42. There was a brief discussion of this problem at the NTSB hearings in Baltimore. CNN reported the incident of the nose wheel doors having being the first event in the break-up of TWA 800, but offered no further explanation. You can read the details at:- http://www.cnn.com/US/9709/05/briefs.pm/nose.gear.doors/index.html . (If this URL does not come up I will post the article later). It should be noted that the nose cone was the next piece of debris closest to the departure point. The nose cone - Section 41 -was located over four miles from the main wreckage debris field, although a small piece of Section 42 had remained attached to the nose cone. I believe the NTSB investigators are going to try and find out how this nose wheel door problem fits into their theory of the failed central fuel tank. Information on this webpage should resolve their dilemma! In 1989, I was introduced to a French entrepreneur who was arranging the financing of a $350,000,000 airplane repair facility near Phoenix, Arizona. According to him and other contacts at that time who were working directly with Boeing, this repair facility was designed to resolve metal fatigue problems that had been identified between Section 41 and 42. I was engaged to raise the financing for this facility. The FAA had published a DIRECTIVE ordering all airline companies using the Boeing 747 to check for fatigue cracking. A schedule for the repairs was issued to all the appropriate airline companies at that time. The first fifteen of the Boeing 747-100's were constructed with parts that met with the Boeing design specifications. The plane was in fact a major breakthrough in technology for its day. 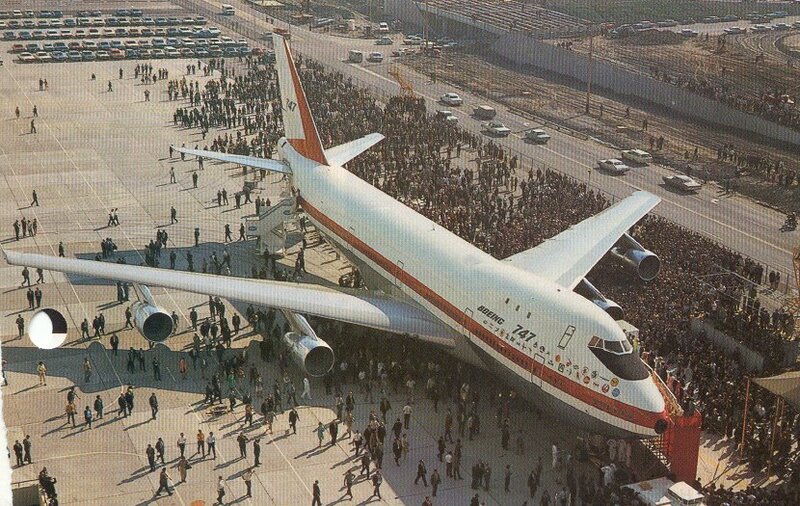 The first Boeing 747-100 was flown for the first time at 11:34 AM on February 9, 1969. The subsequent problems have their roots in the early days of the construction of the Boeing 747's. The aircraft construction business in the early 1970's was extremely difficult. In fact, one wag wrote in the Seattle Times, "Would the last person to leave Seattle please turn out the lights!" Boeing was under pressure to cut costs. According to my sources, to cut costs Boeing discovered that it could purchase aluminum parts from a plant in the USSR (now Russia). The Russians could produce the aluminum to the exacting specifications of the Boeing engineers and did so for the first fifteen planes. Then, Russia decided that it was not profitable to make the aluminum to the Boeing specifications and decide to cheat. The Russians produced an inferior product but sent it to the USA as meeting all of the requirements. It was not until Boeing had made 686 planes, including the 747-100's. the 747-200's and some 747-300's, that it realized that these planes had been manufactured with parts constructed with an inferior quality of aluminum. Boeing knew this constituted a serious problem and designed the necessary modification to remedy the situation. Boeing was a major source of export revenues for the USA and the planes were in big demand since commercially they were very successful. The problem was discovered in the early eighties when there was over a thousand planes flying passengers and freight all over the world. In fact, to shut down over six hundred planes would be a disaster for world commerce apart from the loss of prestige, national pride, and competition from the Europeans who were developing the now equally famous Airbus. On the other hand there were other official determinations as to the problems with Boeing 747's of early vintage. II have accumulated a vast database, which would point otherwise. On December 5, 1998 the NTSB conducted an unusual public debate on the crash of TWA 800 and the author videotaped the entire five days of proceedings, which was aired on C-Span. 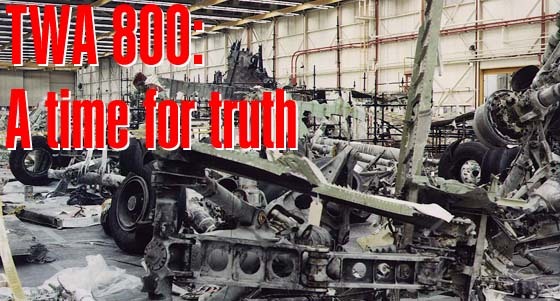 It is not the purpose of this website to review this extremely extensive documentation on the TWA 800 crash as it has been more than adequately covered on the Internet. However, it is important to point out that the NTSB commissioned an independent contractor to conduct a detailed evaluation of the potential explosion in the central fuel tank. This contractor built a one quarter sized model of the Boeing 747 central fuel tank with which to conduct its tests and it was clear that it had great difficulties in creating the conditions under which the JET A fuel would explode, even with a deliberate sparking device in the tank. In fact, for an unexplained reason, the contractor introduced propane - a highly volatile gas - to make sure the tank blew up! The explosion was spectacular and, needless to say, it was shown on CNN ad nauseum with no detailed explanation. It is extremely difficult to get JET A fuel to burn - let alone explode. This is more fully explained at the excellent website --- www.twa800.com. It is important to note on this website that Commander William Donaldson - a jet pilot - conducted a test to see how flammable jet fuel would be. Using a barbecue as the source of heat, he placed a tray of jet fuel on the rack and heated it to the temperature that was determined to be in the central fuel tank of TWA800 before it left the airport. He tried to light the fuel with a match, and even doused the flame by placing the match into the fuel itself - clearly demonstrating that jet fuel is difficult to burn, let alone cause an explosion! The CIA did a great job of creating a simulated TWA 800 video showing Section 41 and Section 42 breaking away from the main fuselage caused by the "exploding central fuel tank." The video is extremely graphic in that it can also demonstrate what would happen if Section 41 & / or 42 broke away, which in turn would cause the fuel in the central fuel tank to ignite (not explode) and moments later the fuel in the wing tanks. That makes much more sense. It certainly makes more sense than the theories proposed by the Pierre Salinger (now retracted), the missile theory, and if you want to know how that came about and what his neighbors are saying; read my book "Plane Truth - an Investigator's Story." Read what I say about these CIA / NTSB videos in my book. These videos can be seen here). They are large files so please be patient. Recordings/CIA One. Recordings/ CIA Two. Recordings/CIA Three. As you will soon appreciate, the whole fiasco appears to be a major cover-up. It is possible that the NSTB and the FBI are unaware of the truth, but this is hard to believe. In my opinion, this tragic accident did not have to happen. Please note that of all the hundreds of pictures of TWA 800 after the crash ,not one is of Section 41 & 42. Furthermore, of all the interviews conducted by the media, not one was with an experienced Boeing 747 pilot!! Check out the TWA accident report. The official version of events was the explosion of the central fuel tank, which blew off the front third of the plane. However, read the official accident report; it states that Section 41 separated from Section 42 and took a part of Section 42 with it. Check out the debris fields too. Really! For more details on the problems I refer you to the Fatigue Details herein. CNN reviewed the TWA 800 disaster, and a lot of new information was brought to the public attention. I decided to start a new webpage, which you can review at the webpage above - TWA 800,2007. I discovered that the TWA 800 plane which crashed off Long Island in 1996 was manufactured in the early 1970's, being number 159 off the production line. What was most significant, however, was the notation that the required repairs to Section 41 were about to be undertaken in 1996 with the ordering of the parts in March, 1996 ................... and the crash occurred just four months later! A new documentary on TWA 800 was aired on EPIX.com. on July 17, 2013. This is an important documentary in that it claims that TWA 800 was brought down by one or more missiles. The claim that the missiles exploded close to the plane. However, missiles normally strike the target before exploding! For further details, visit the webpage TWA 800, 2007. You are visitor no. since June 24, 2013.